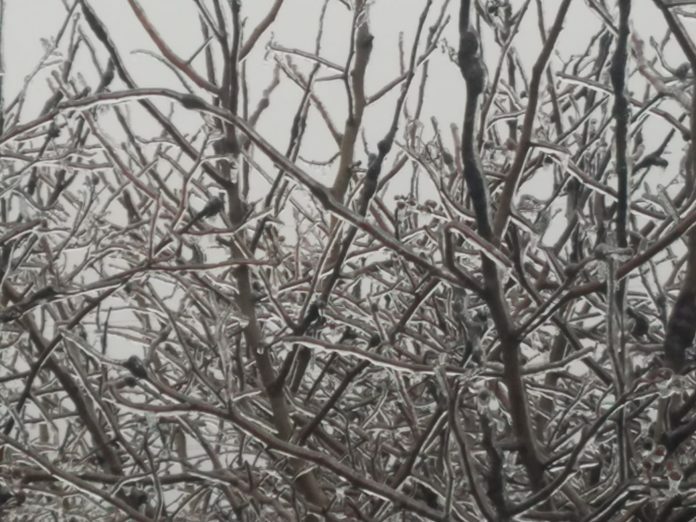 Freezing rain glazes a tree otuside of the 953 MNC newsroom. Photo by Tommie Lee. Northern Indiana is facing icy conditions, potentially damaging winds and flooding. The region remained under ice storm warnings or winter weather advisories on Tuesday morning, Feb. 12, while the middle of the state was bracing for high winds that could lead to power outages. Flooding was reported in central and southern Indiana, including along the White and Wabash rivers. The ice storm warning prompted officials on Tuesday to suspend train service on the South Shore Line in northwest Indiana. “Ice-breaker” trains were working to de-ice the overhead wires that power the South Shore Line. The areas biggest school districts, including South Bend, Mishawaka, Penn Harris Madison and Elkhart, changed from two-hour delays to day-long closures. The weight of ice on power lines also caused a number of outages. By 9 a.m. on Tuesday, more than 25,000 Indiana Michigan Power customers were left without electricity. Scattered rain showers then last into the afternoon but then changes BACK to snow late afternoon. Scattered snow showers then last through the night but beginning tapering down Wednesday morning. 1-3” of snow is likely with locally higher amounts in our Michigan counties. Winds pick up today becoming very gusty for Wednesday. Wind gusts will be around 35-45 mph so isolated power outages will be possible. We are briefly quiet for the start of Thursday before the next messy system moves in during the evening turning to snow Friday morning. Tuesday: Light showers and drizzle changing to PM snow, turning breezy, high of 38. Tuesday Night: Scattered snow, low of 23. Wednesday: Morning lake effect snow, mostly cloudy and windy, high of 32. Thursday: Mostly cloudy with a chance of evening showers, high of 44.